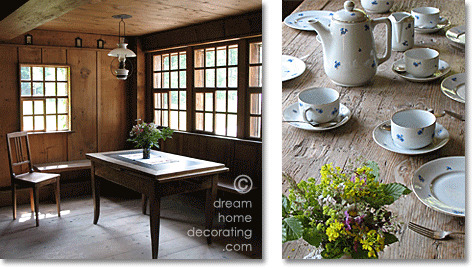 Swiss country decorating is understated and quietly beautiful. Here's a checklist for original Swiss decorating style. My friend Ruth and her family live in a small village an hour's drive from Zurich, with stunning views to snow-capped mountains, and surrounded by woods and meadows. The family own an 1850s farmhouse that was built by Ruth's great-grandparents. Ruth has always lived in Switzerland and loves the countryside. Her garden is sensational, and she has a wonderful, original interior decorating style. Wood dominates the look of Swiss country homes: Floors, walls and furniture (in traditional shapes and designs) are usually made of softwood (pine, fur, larch) with untreated and unpainted surfaces. Apart from cupboards, armoires, cabinets and credenzas, traditional Swiss country interiors also have wooden chests to hold clothes and personal belongings. Occasionally, flooring can consist of terracotta tiles (in the living space) or bricks (in work areas). There's no place for posh china - earthenware jugs and bowls and heavy porcelain (plain white, or with a small floral pattern) are kept on plate racks or in open hutches. A large tiled oven in blue, green or brown usually dominates the living room in rural Swiss country homes. It can reach almost to the (low) ceiling, and is often surrounded by a bench with cushions, where people can sit and warm up in the winter. High-backed sofas (in Swiss country decorating they are upholstered in sober colors) often have woollen blankets on them. Rag rugs are occasionally used to cover parts of the floor - Ruth finds them a bit twee and would never consider having one herself! Rendered interior walls are whitewashed; wood paneling may be painted white (or occasionally sky blue), but generally it's left in its original state. Interior textiles (linen, cotton, and wool) are mostly white in Swiss country decorating. Bedlinen can have a light color woven into it - blue is the most common for Swiss decor. Cushions and table runners are often embroidered in Swiss country style homes. Colorful flower bouquets from the garden play an important part in Swiss country decorating. Often foliage and even small branches with berries are mixed in with the flowers. Gardens are an important part of Swiss country life - they provide some of the food and fresh color for the home. Swiss decor isn't limited to the interiors: in many Swiss regions, facades are decorated with stylised flower paintings or wooden fretwork. The architectural range of Swiss houses goes way beyond Swiss chalet style. Non-Swiss people often think of 'gingerbread' chalets as the (stereotypical) Swiss style homes, but there's so much more! Of course, you could take a month off and travel all over Switzerland to look at Swiss country homes. But save yourself the time, just take one day off and go to Ballenberg. It's the perfect place to study traditional Swiss country decorating. So if you're interested in traditional Swiss country decorating (or any aspect of historic Alpine country life, really) and happen to be in the area, do go and visit Ballenberg. It's a great day out. To create the look of Swiss country decor, you won't need to build a Swiss-style chalet in your backyard, but it's useful to have at least some reliable, nuts-and-bolts information about log cabins. Check out this page about log cabin interior finishings, flooring & fire precautions! What is it that actually makes a style "Country"? 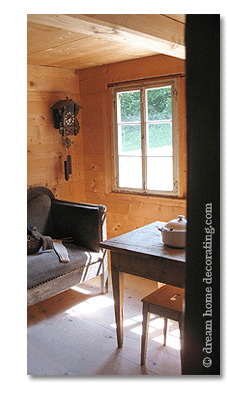 Rustic ideas that work a treat for Swiss country decorating. Check out country cottage decorating ideas from Sweden, France/Provence, and Italy/Tuscany. Learn about neutral color palettes and how you can use them in Swiss decor. Understand what makes neutral color schemes look their best, and what happens when you inject 'real' color into neutral color palettes. Perfect for Swiss decorating, and ... it's FREE!! Return from Swiss Country Decorating to Country Decorating Ideas. Return from Swiss Country Decorating to the Dream Home Decorating homepage.